I love pizza. Love, love, love it. When Pizza Hut came to India way back in 90’s, the CP outlet became our favourite hang-out place. College treats, celebrations started and ended with Pizzas. I am sure you get the gist. Slowly the quality of pizza went down IMO with advent of Indian flavours. Uhhh! All good things must come to an end. I was introduced to thin crust pizzas at Bella Ciao in Chennai and have never ever favoured any other crust since then. Thin crust all the way for me. Bella Ciao has very special memories for me – of friendship, of loneliness, of sea, of smell, of salt, of breeze, of night, and much more. My regular readers would know how much I rant about moving from refined flours to whole flours. So pizza is no different. Wheat in bread is not always a winner but when I came across this recipe, I read the reviews and realized that every single one of them is giving it a thumbs up. I knew I had to try this. 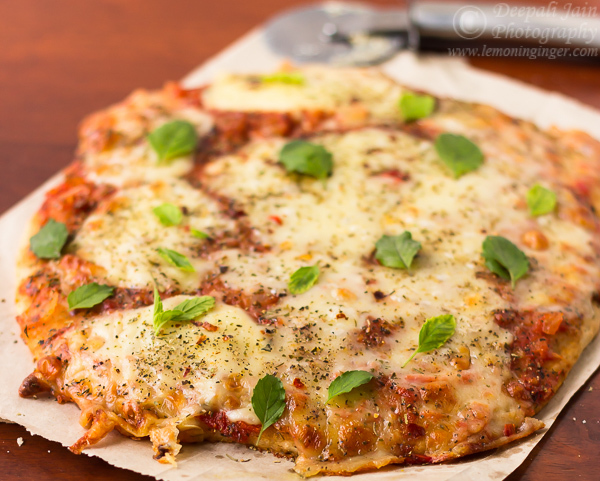 I made this recipe on a weekday when my kids were craving pizza, I was very lazy that day and didn’t click any images but when we all loved the result, I happily decided to make this again and shoot. The occasion presents itself when the mood strikes. So one fine morning I was in a mood to prep for the pizza, but kids have a mind of their own and every time they see mom may get busy with some baking, they divert my attention. I decided to knead the dough and freeze it and bake it when the days are back to normal. I love recipes which can be made ahead in parts and doesn’t bog me down at one go. Many of you ask me ‘How do I manage with kids?’ Well that’s the secret, I don’t try to be a superwoman and do everything at one time, I break almost all recipes in steps and prepare them ahead of time and just give final assembly on the required day. 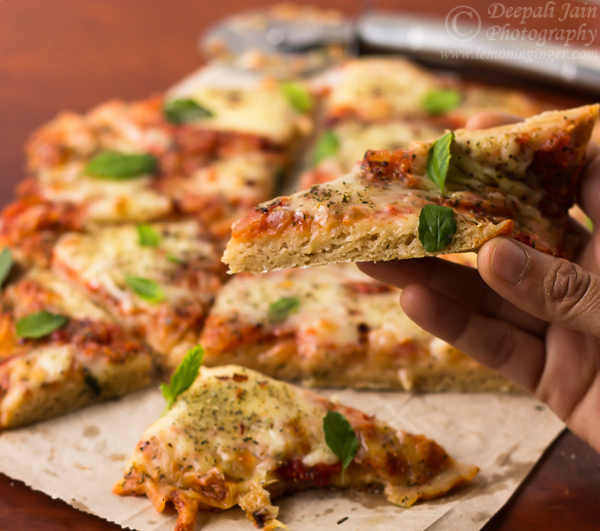 Coming back to the pizza, true to the reviews, this pizza is great and healthy too. Since my kids have started loving Margherita flavour, I have also stuck to it. I got 4 kids who gave this full marks and 4 adults too. So I guess that’s all that matters. 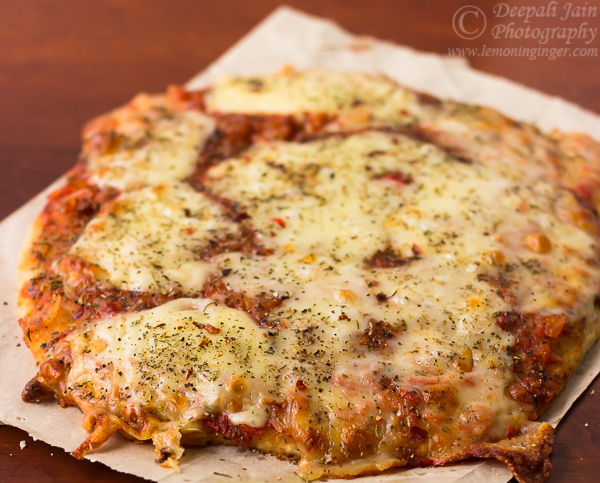 A soft, fluffy and healthy pizza with 100% whole wheat flour. You will be hooked for life. In a small bowl, combine yeast, water and 1 teaspoon of sugar. Let it sit for five minutes or till it becomes bubbly. In a large bowl combine 2 cups flour, salt and remaining sugar. Make a well in the centre and add yeast mixture and olive oil. Stir using a spoon until the dough just comes together, then knead, either by hand or with the dough hook, for about 5 minutes (3-4 minutes if using dough hook). Add remaining flour in 1 tbsp increments just until dough pulls away from sides of the bowl or is no longer sticky. You may not use all the flour. Shape dough into a ball, liberally spray with olive oil and at this point you can store in freezer (upto 1 week) or refrigerator (use within 24 hours) in a ziplock bag. If you wish to use the same day then skip the above step and place the dough in a lightly greased bowl and cover with lightly greased plastic wrap to rise until doubled, about 45 minutes to 1 hour. Punch down risen dough, divide and shape into 2 balls and place on a lightly floured pizza stone. Roll out into a circle of desired crust thickness and let rest about 10 minutes (at this time you can put on your desired toppings). If you have let your dough have a slow rise in refrigerator, then remove it and divide the dough in two equal parts and form a ball. Place the dough on a lightly floured surface. Slightly flatten it into a disc and allow it a rest for 30-40 minutes. Roll out into a circle of desired crust thickness and let rest about 10 minutes (at this time you can put on your desired toppings). 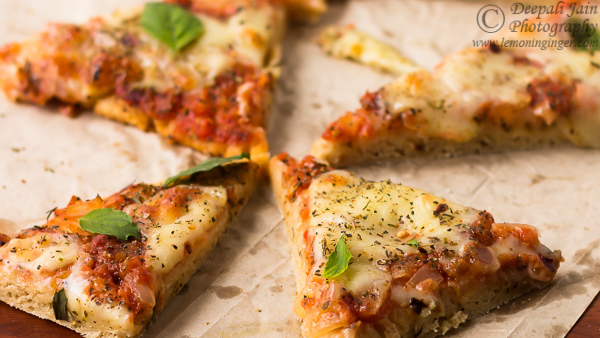 Preheat oven to 500 degrees F. Place pizza in oven and bake about 10-15 minutes, or until crust is golden brown and toppings are baked. 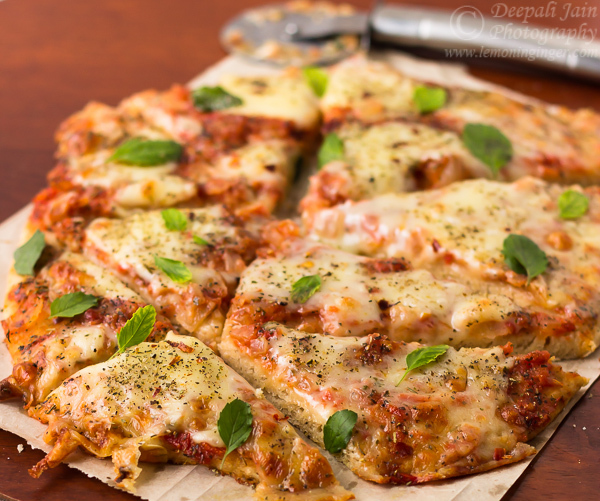 Let pizza rest for about 10 minutes before slicing. Repeat for 2nd pizza. I prefer slow rise of refrigerator than immediate rise. I usually make 2 pizzas from this, but you can make only one as well. Bake Fest # 36 originally started by Vardhini.